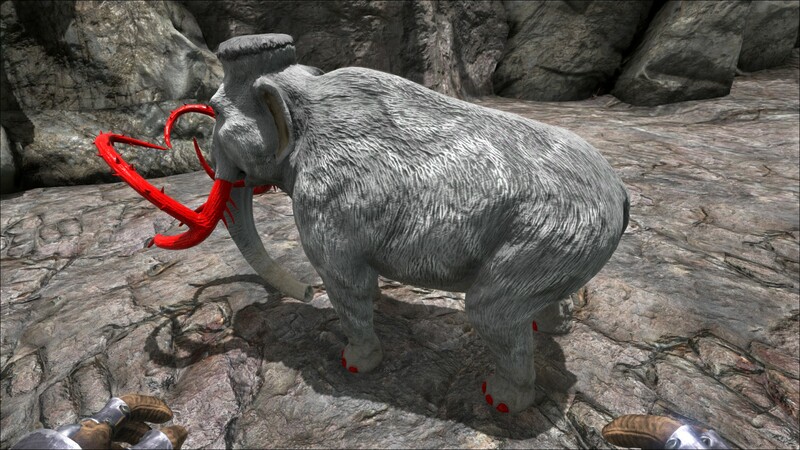 The Mammoth or Woolly Mammoth, is one of the Mammals in ARK: Survival Evolved. Mammoths are a large, relatively slow but powerful creature that live in the colder areas of the island. It is one of the only creatures that can effectively gather Wood. This behemoth towers over many creatures on the Island, and does not seem to fear anything but the Tyrannosaurus. Mammoths generally thrive in colder areas, and have a herd mentality. I'm honestly not certain how the herds of Mammoths find enough plant life to graze on some of the Island's mountains. They must spend much of their time travelling between the mountains' cold summit and more lush base. Or maybe the Mammoth herds are the main reason the summits are so barren. Mammuthus steincaput is a difficult beast to domesticate. Not because they are inherently stubborn, but because knocking one out to begin the taming process takes great effort. Once tamed, however, Mammoths are one of the only creatures on the island that can uproot trees without shattering them. Mammoths are herd animals, meaning that if one gets attacked, any other nearby Mammoths come charging in and start attacking what attacked them. If you attacked one by accident and you don't want to fight just run a few meters, they will stop chasing you after just a few seconds. The Mammoth is a large, furry mammal that can be found wandering around the sides or bases of mountains. Out of its proud skull grows a kind of hair cap, like a crown. Its thick pelt is textured with thin, horizontal wave-like stripes. Like every other elephant and elephant-like species, it sports elephant-like feet, a short, stubby tail, and a long trunk for a nose. Its distinctive tusks grow a way similar to African elephants. But, unlike the still living elephant species and even the ones found in the fossil records, the tusks branch out near the base, with the second 'branches' clearly spirally turned upwards, with the pointed ends facing each other. There are also thorns on those segments along with a few thorns under the branching area. In addition, the mouth has smaller, upward-facing tusks. This section displays the Mammoth's natural colors and regions. For demonstration, the regions below are colored red over an albino Mammoth. The colored squares shown underneath each region's description are the colors that the Mammoth will randomly spawn with to provide an overall range of its natural color scheme. Hover your cursor over a color to display its name and ID. For example, "cheat SetTargetDinoColor 0 6" would color the Mammoth's "fur mane" magenta. This section describes how to fight against the Mammoth. 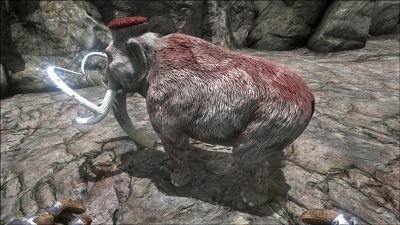 The Mammoth is extremely slow, the easiest way to gain its precious pelt is using a Metal Hatchet. Its knockback effect can be extremely dangerous (be careful while attacking them near a cliff). It is passive unless provoked. Start attacking from the back or you can use a crossbow and run away. Engaging in melee attacks can be extremely dangerous. If you have a high level sabertooth or other creature, use it to tank damage while you shoot at it from afar. When attacking one mammoth, other mammoths will run after you too, but they stop after a few seconds. Getting seriously hurt and strong knockback. The Mammoth is tamed violently, i.e. it must be knocked out and fed with food it likes. Kite it like anything else, they're relatively slow. Use caution when taming a Mammoth as the location in which they spawn (the snow biome) is usually littered with animals that want to kill you and the low temperatures will slowly drain your life, if unable to protect yourself against the weather, you might want to try and kite them out of the snow biome into the warmer jungle. Gatherer: Excellent for gathering materials like Wood. Even more so after the April 6th, 2017 patch 256.3 (PC) which gave Mammoths a 75% weight reduction to wood as a follow up to the flier nerfs of patch 256. (Damage, Weight, and Stamina) Also if you look left while harvesting wood you will get the faster animation and faster harvest rate. Siege Engine: On ARK: Survival Evolved Mobile, the Mammoth can be equipped with a Mammoth Side Saddle. This special saddle acts as a platform for building and supports any Turrets (Single Player only). The structure limit for the Mammoth Side Saddle is 90. 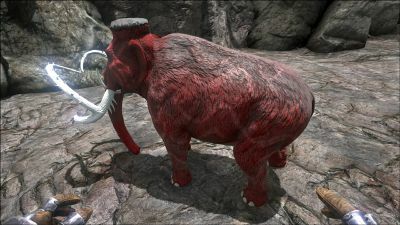 Sprayer: On ARK: Survival Evolved Mobile, the Mammoth can use its trunk to absorb water. It can then spray it. This is useful to move many Creatures, to disable electrical systems, to irrigate Crops, or to put out fires. The water a Mammoth can carry is dependent on its Capacity. This stat is determined by breeding Mammoths. "Steincaput", which is a fictional species of the Mammuthus genus, seems to be a compound term composed of the German word stein, meaning “stone”, and the Latin word caput, meaning “head”. “Stone head” could be a reference to the species' apparent stubbornness or a reference to their tough skulls. Besides this, "stein" might be a slight nod to the similarity between the heads of the Mammoth and Frankenstein's monster. Mammoths require a Behemoth Gateway. They can walk through a gap three foundations wide, but two is too narrow.